Refugees should be allowed to reach safety legally and by plane, the Refugee Council has said today. Ahead of a special UN conference on Syrian refugees on 30 March, the charity is calling for Britain to offer more refugees safe passage. At the conference in Geneva, the UN’s Refugee Agency (UNHCR) is calling for countries to offer safe pathways to refugees fleeing Syria’s brutal war, which is heading into its sixth year. Britain’s Minister for Syrian Refugees Richard Harrington is attending the conference and will have the chance to offer refugees fleeing Syria’s brutal conflict more safe and legal options for international travel. At the moment, refugees fleeing war and persecution have little option for safe, legal international travel. When war breaks out, countries like Britain often close down refugees’ legal options by refusing to issue them travel visas. This means they can’t get on planes. Other harsh rules stop refugees joining their loved ones who have already made it to safety in other countries and there simply aren’t enough resettlement places to go around. This is how refugees can end up in smugglers’ hands. London Metropolitan Archives (LMA) will be holding a symposium to provide a platform to heritage practitioners who follow the ‘history from below’ approach in recollecting cultural memory. In the past three decades there has been a debate between the postmodern cultural theorists and the heritage sector over the power held by archives as institutions. Archives are seen as not only being able to wield power over the shape and direction of historical scholarship, collective memory, and national identity but also over how we know ourselves as individuals, groups and societies. The post-colonial heritage theory suggests that individuals belonging to a national community have different experiences to the same past and do not share an identical memory related to the same spaces, places and events and therefore conceive their heritage through multiple frames of reference. 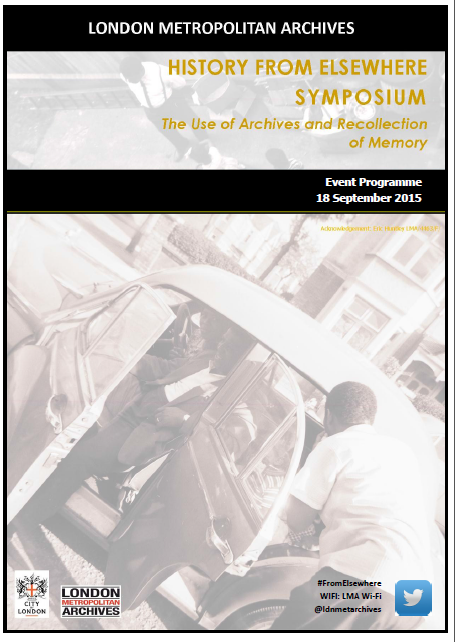 The symposium therefore aims to explore the way archives are accommodating the multiple frames of conception of the past and also discuss the challenges in making archives more accessible and inclusive. Paul Dudman is the Archivist at the University of East London which include the Refugee Council Archive, Refugee Action, and the Council for Assisting At-Risk Academics. Additional collections include the British Olympic Association and Hackney Empire theatre. Professional activities include the Campaign for Voluntary Sector Archives. Rumana Hashem is a Bangladeshi-born activist-sociologist and at Post-doctoral researcher, affiliated with the Centre for Migration Refugees and Belonging at the University of East London. Rumana completed her PhD on Gendered Relations in the ethnically constructed armed conflict in south-east Bangladesh. She actively contributes to the Phulbari Solidarity Group as a Coordinator, and at Nari Diganta as a key organising member, and London Roots Collective as a Facilitator and Trainer. Since June 2009 I have led the ground breaking Accentuate Programme, which challenges perceptions of disability by providing life changing opportunities for Deaf and disabled people to participate and lead within the cultural sector. In May 2015 we received £858,500 from HLF to deliver Accentuate History of Place; a nationally significant social history programme which will chart disabled people’s lives from the middle ages until the late 20th Century in relation to built heritage. Fiona Cosson is a Research Associate at the Manchester Centre for Regional History at Manchester Metropolitan University. Her research interests focus on Oral History; Local, Community and Public History; and the History of Community and Neighbourhoods. She is a co-founder/convenor of the Unofficial Histories conference, Trustee for the Oral History Society, and Public History Editor for the Oral History Journal. Iqbal Husain has over 20 years’ experience in managing projects that engage communities in cultural activities. He has completed a related programme of studies, including a Masters in Public Administration with a particular focus on arts and cultural engagement. Iqbal Husain is also the director of a not for profit arts organisation, Shared Heritage, that conducts work with diverse and marginalised communities. Raju rage is a multi-disciplinary artist and community organiser who is proactive about creating space, self-representation and self-empowerment using art and activism to forge creative survival. Evan Ifekoya is an Artist and Educator with an interdisciplinary practice, based in performance and video, exploring the politicisation of culture, society and aesthetics. Raisa Kabir is an artist, writer and cultural activist, currently occupied in translating theory based ideas, to visually conceptualise the interrelated politics of the body, racialised labour and space. Jessica Green has been working at the Wiener Library since October 2013, first as a Library Intern and most recently as Digital Curator. Before moving to the UK, she completed her MS in Library and Information Science at Simmons College in Boston, MA, and gained work experience at the Harvard Theatre Collection and the JFK Presidential Library and Museum. Kat Petersen has been an archivist since 2003 and is currently working at the German Historical Institute London after posts at the Freud Museum and the British Library. She completed her MA in Archives and Records Management at UCL in 2015. Her research interests include archives in post/neo-colonial contexts, the role of archivists in society, and perceptions of archives and archivists. Marion Vargaftig is a creative producer/consultant in UK/Europe. She devises innovative initiatives associating media and culture to promote social change. Marion co-founded Manifesta, an organisation that develops and delivers projects and productions with mixed age groups – in marginalised urban locations, on issues related to cultural diversity, antiracism and social exclusion, looking at the social archaeology of neighbourhoods. Kumiko Mendl has worked as an actress, teacher, storyteller and director for stage, TV and Radio and has been Artistic Director of Yellow Earth Theatre since 2011. Last year she conceived and co -directed The Last Days of Limehouse a promenade piece about the original Chinatown in London staged in Limehouse Old Town Hall. Currently she is working on a new play inspired by the little known story of the Chinese Labour Corps, the 96,000 men who came from China to work for the allies during the First World War. Many apologies for the slightly belated circulation of this the third issue of Refugee Archive News: The Refugee Council Archives at UEL (hopefully) Weekly Bulletin. This bulletin has the aim of providing both the latest news and developments on the Refugee Council Archive at the University of East London whilst also providing additional information on issues of concern to refugee and forced migration studies more generally. This I hope will include details of news stories, calls for papers, conferences and seminars, and online resources of potential interest. This bulletin, I hope, will aim to provide useful information to both students and academics on both UEL undergraduate courses in International Development and postgraduate students on our courses in Refugee Studies; Refugee Studies and Community Development and Conflict, Displacement and Human Security, whilst also being hopefully of interest to a wider readership represented by our Twitter and Blog followers. This bulletin will be circulated via our Refugee Archive WordPress blog and also via our Refugee-Research Jiscmail email list. We would welcome any feedback that you may have on this bulletin and we would also welcome any input that you may have in terms of current and future content for both this bulletin and also our WordPress blog more generally. Please Contact Paul Dudman via email (library-archvies@uel.ac.uk) or Twitter (@PaulDudman) with any feedback or thoughts that you may have. There are also some general Archive details included at the end of this and every bulletin posting for your reference. Amnesty International – Racism, segregation, and rejection: The reality for Romani children in the Czech Republic. British Red Cross – Asylum seekers sent to hotels without essentials or medicine. Electronic Immigration Network – Court of Appeal warns over asylum legacy cases, saying commonly repeated arguments are now “laid to rest”. Electronic Immigration Network – Very private lives: “acceptable questioning” in sexual orientation asylum cases. Electronic Immigration Network – Control and restraint techniques used on people being removed from UK are lawful, says Court of Appeal. Electronic Immigration Network – New UN guidelines on the rights of women asylum seekers and refugees. The Compas Blog – Schooling, mobility and belonging. UNHCR – UNHCR warns of winter crisis ahead for almost a million displaced people in Iraq, Syria. UNHCR – Education Above All Launches Multi-Sector Education Project in Kenyan Refugee Camp. UNHCR – UNHCR welcomes new General Recommendation on refugee and stateless women. BBC News – Syria crisis: Istanbul misery for desperate refugees. BBC News – Syria war refugees’ key role in telling the story. BBC News – Inside a supermarket for Syrian refugees in Jordan. Daily Mail Online – Paddy Ashdown accuses government of policy ‘to drown more refugees in the Mediterranean’ by blocking rescue efforts. Guardian Online – Scapegoating immigrants is the oldest trick in the book. Guardian Online – More immigration – but managed much better. That’s what the UK needs. Guardian Online – Theresa May downgrades Cameron pledge to reduce net migration. Guardian Online – Serco shares crash after latest profits warning. Guardian Online – Sandwich maker goes ahead with Hungary hire drive. Guardian Online – A good mix: why ethnic minority pupils boost school achievement. Guardian Online – Bordergame review – immersive theatre show casts audience as refugees. UK Climate Change and Migration Coalition – Trapped Populations – Hostages of Climate Change and other stories. DW – ‘Triton’ sets out to rescue refugees. Telegraph Online – Wealthy foreign tourists and business people to be given fast track British visa. Telegraph Online – Britain must now curb migrant tax credits, Iain Duncan Smith says. Telegraph Online – Earl of Sandwich says migrant workers can make ‘good or better’ sandwiches. Telegraph Online – Romania and Bulgaria migrants reach record high. Telegraph Online – We can’t control our borders until we control those judges. Telegraph Online – Immigration: the real cost to Britain. Telegraph Online – Immigration report too ‘narrow’, says minister James Brokenshire. UNHCR – Sharp increase in number of Eritrean refugees and asylum-seekers in Europe, Ethiopia and Sudan. The Guardian – Riot police deployed after violence against refugees in Rome. The Guardian – David Cameron backs John Major’s warning on future of UK in Europe. Free Movement – Legacy cases “laid to rest” by Court of Appeal. Lives in transition : experiences of migrants living in Morocco and Algeria / research by Andrew Galea Debono based on interviews with migrants in Casablanca, Rabat and Tangiers in Morocco, and in Algiers, Oran and Tamanrasset in Algeria. After the Arab Spring : new paths for human rights and the internet in European foreign policy / by the European Parliament Directorate General for External Policies Policy Department. Desperate choices : conditions, risks and protection failures affecting Ethiopian migrants in Yemen / a joint report by the Danish Refugee Council (Regional Office for the Horn of Africa and Yemen) with the Regional Mixed Migration Secretariat, (RMMS). Statelessness and the benefits of citizenship : a comparative study / [edited] by Brad K. Blitz and Maureen Lynch. Access to healthcare in Europe in times of crisis and rising Xenophobia : an overview of the situation of people excluded from healthcare systems / by Dr. Pierre Chauvin, Nathalie Simonnot and Frank Vanbiervliet. Refugees in Europe / Danièle Joly with Clive Nettleton. Romania’s ethnic Hungarians / George Schöpflin and Hugh Poulton. Minorities in southeast Europe : inclusion and exclusion / $$c by Hugh Poulton. Minorities in Central and Eastern Europe / edited by Minority Rights Group and TWEEC. At fortress Europe’s moat : the “Safe Third Country” concept / [written by Steven Edminster.]. Refugees; the work of the League / by C. A. Macartney. Aftermath : France, Germany, Austria, Yugoslavia, 1945 and 1946 / Francesca M. Wilson. “Safe third country” policies in European countries / edited by Nina Lassen and Jane Hughes. Quest for quality educational guidance for refugees in Europe / by Ayten Sinkil. Refugees included : a survey of refugee involvement in refugee-assisting non-governmental organisations in the European Union / by Hildegard Dumper. Developing transnational partnerships : a guide for voluntary organisations working on EC funded projects / Ute Kowarzik and Maggie MacDonald. Proceedings of the 2nd Colloquy on the European Convention on Human Rights and the Protection of Refugees, Asylum-seekers and Displaced Persons : consolidation and development of the asylum-related jurisprudence of the European Court of Human Rights / organised jointly by the Council of Europe and the Office of the United Nations High Commissioner for Refugees (UNHCR), Strasbourg, 19-20 May 2000. UNHCR’s dialogues with refugee women / Office of the United Nations High Commissioner for Refugees. Survivors, protectors, providers : refugee women speak out / Office of the United Nations High Commissioner for Refugees. A global review : UNHCR’s engagement with displaced youth / By Rosalind Evans and Claudia Lo Forte with Erika McAsian Fraser. An introduction to cash-based interventions in UNHCR operations / Office of the United Nations High Commissioner for Refugees. UNHCR’s mental health and psychosocial support for persons of concern : global review – 2013 / Office of the United Nations High Commissioner for Refugees. The implementation of UNHCR’s policy on refugee protection and solutions in urban areas : global survey – 2012 / MaryBeth Morand, Katherine Mahoney, with Shaula Bellour and Janice Rabkin. Passages and junior passages : an awareness game confronting the plight of refugees / Office of the United Nations High Commissioner for Refugees. Carly / Office of the United Nations High Commissioner for Refugees. Not just numbers : [educational pack] / Office of the United Nations High Commissioner for Refugees. Through the eyes of refugees : looking to the future / Office of the United Nations High Commissioner for Refugees. Ageways: Practical Issues to Ageing and Development. Issue 82, March 2014. Australian Journal of Emergency Management. Volume 29 Number 2, (April 2014). ARC Magazine. Number 297, (May 2014). 0430-0500: BBC News 24: Our World – Rojava: Syria’s Secret Revolution. Series Recording. 2235-2320: BBC1: Panorama – Ebola Frontline. 1935-2000: Channel 4: (8/8) Unreported World – 15 and Learning to Speak. Series Recording. The current Opening Hours for our Archival collections are detailed as follows. The Refugee Council Archive and the British Olympic Association Archive are currently located on our Docklands Campus Library whilst the Hackney Empire Archive is currently located in our Stratford Campus Library. Access to the Stratford Archive for the Hackney Empire Archive is by prior appointment only. * Morning appointments between 10am and 12pm are available by prior appointment. The Archive will be closed between 12pm and 1pm for lunch. We would recommend that, especially for external users, that you contact us in advance of your trip in order to make an appointment to use the Archives. This enables us to ensure that a member of staff will be on hand to assist you. To make an appointment, please click on the link to our Make an Appointment page. www.jiscmail.ac.uk, type REFUGEE‐RESEARCH into the ‘find lists’ box, or use the alphabetical index to scroll down to R. and then follow the instructions on our REFUGEERESEARCH homepage to ‘join or leave the list’. Most users need only enter their email address and name. Alternatively, email the Archivist, Paul Dudman on p.v.dudman@uel.ac.uk, requesting to join the mail group. Please let us know of any further links that you would like to see added. Paul Dudman is currently the Archivist responsible for all of the physical Archives located here at the University of East London Library and Learning Services: Archives. Paul is happy to receive and respond to any questions or queries that you may have in response to both our Archival collections and also our social media presence. The Refugee Council have training dates coming up in November. All courses will take place at Refugee Council head offices based in Stratford. Working with asylum seekers and refugees requires an understanding of some key issues. Asylum and immigration legislation and policy are characterised by frequent changes which can make it difficult for practitioners to keep up-to-date and offer accurate advice and most effective practice. This course will provide an overview of some key structures in the asylum system (including determination and support) in order to support delegates’ understanding of asylum issues. The aim of the course is to examine the effects of trauma and loss on emotional well-being of refugee children and young people and to develop further understanding of their overall needs. Participants will be provided with the tools to assess the organisation in which they work, to identify factors which are detrimental to emotional well-being and to devise strategies for providing appropriate care and support. This course aims to give delegates a thorough understanding of the legal and policy framework around age assessment, and practical insight into what is required of a social workers undertaking this assessment and the roles of others involved in the process. Delegates are invited to consider the child’s background, the impact of the assessment on the child, and the context within which it takes place.
. The legislative and policy framework of Children’s Services and the Home Office. End of Process is the term used to describe the situation for those asylum seekers who have been refused asylum and have exhausted all appeal rights. UK policy states that when someone is in this position they are no longer entitled to many services and support, including asylum support. For many asylum seekers at the end of the process who are unable or unwilling to return to their home country, this means that they become destitute. For those working in the voluntary and statutory sector, knowing how and when they are able to support asylum seekers at the end of process is a challenge. Service providers often hear conflicting messages and myths, and can struggle to ensure they are up to date with the continual changes to policy and procedures to support entitlements and legal options. Ask us about in-house courses by emailing training@refugeecouncil.org.uk or call 020 7346 6737. The Refugee Council, in collaboration with the Refugee Law Initiative at the School of Advanced Study, is hosting a film screening and panel discussion entitled ‘Crisis in Syria: Conflict & Refugees’. Four short documentary films on the Syrian crisis will be shown, followed by an expert panel discussion. The panel discussion will include: Roland Schilling (UK representative, UNHCR), Olly Lambert (Filmmaker), Maurice Wren (CEO, Refugee Council and panel Chair), Sonia Koury (Syrian refugee doctor) and further speakers (TBC). Date and time: Friday 22nd November, 6.30 – 9.00pm (refreshments will be served). Location: Chancellor’s Hall, Senate House, Malet Street, London, WC1E 7HU. To book your free tickets please RSVP to rebecca.lancaster@refugeecouncil.org.uk. Age Assessment Awareness and working with age disputed young people. Our next date for Age Assessment Awareness and working with age disputed young people will be 5th November. Ensuring the well-being of unaccompanied refugee children and young people is at the heart of this course, which aims to give delegates the confidence and information they need to challenge assessments, and the tools to ensure that the correct processes are in place in your organisation. Please note this course will be held at our head office in Stratford. Book now: email training@refugeecouncil.org.uk. We also offer this course as in-house option see below. We also offer our training courses as in-houses courses, where the trainer comes to a venue of your choice. Ask us about in-house courses: call 020 7346 6736 or email training@refugeecouncil.org.uk. Please note all courses are subject to VAT at the current rate. Source: Forced Migration Discussion List. We would like to inform you of the date of Refugee Council’s conference on children, taking place on 12th February 2014 (follow this link to view this save-the-date email in your browser: http://noreply.refugeecouncil.org.uk/I6P-1SQN3-9D31JK3QCA/cr.aspx). We understand that working with children and young people from abroad can be challenging in the current climate, and that it is sometimes difficult to support them through difficult circumstances in the light of changing policies and limited resources. This conference has been designed to support you in your work and to keep you abreast of policy and processes affecting young people. The conference will offer up- to-date information, practical advice and an opportunity to discuss how policy and practice can be improved. Issues to be covered in presentations and discussions include – Legal Aid, duties to families with no recourse to public funds, trafficking and the latest on age assessments. The conference will take place at the KPMG building, Canary Wharf, London.